License for minors is vertical with "UNDER 21 Until 00-00-0000" written in white, within a red bar above the photo. For additional information about minor licenses, visit here. Minor license is vertical with newer licenses. "UNDER 21" (in yellow) Until 00- 00-0000" (in white) beside photo. In older licenses, "UNDER 21 Until 00-00-0000" appears in red above the signature and the photo is on the left. A small picture of minor license can be found by following the 'Features of the License' link on the Driver License Information page. Vertical format with a black "UNDER 18 UNTIL 00-00-0000" in a yellow bar below the photo, and a white "UNDER 21 UNTIL 00-00- 0000" in a red bar below yellow bar. Photo and Date of birth have red borders. Also note: an "intermediate" license includes a yellow map of Arkansas and a learner's permit includes a white map. For more information and/or an image, visit here. Minor licenses are vertical with a ghost image at the lower left. Under 21 licenses have white "AGE 21 IN (0000)" in a red bar; under 18 licenses have white "PROVISIONAL UNTIL AGE 18 IN (0000)" in a blue bar. For additional information and/or an image, visit: State of California Department of Motor Vehicles. License for minors is vertical. "UNDER 21" is in red above the photo. Prior licenses included "UNDER 21" in a yellow bar at the far right of the card or "UNDER 18" in a red bar at the far right. For additional information about minor licenses, visit here. License for minors is vertical. "UNDER 21 UNTIL 00-00-0000" is in red bar to right of primary photo. If under 18, "UNDER 18 UNTIL 00-00-000" is in yellow bar to left of red bar. Primary photo is on left side with a small duplicate ghosted photo image on bottom right. Learner's Permit has the state name in yellow. Identification Card has the state name in red in a green bar. For additional information and/or an image, visit here. License for minors is vertical. Black "18 ON 00-00-000" in a yellow bar to the right of the photo, or white "21 ON 00-00-0000" in red bar to the right of the photo. Prior licenses had a white "18 ON 00-00-0000" and "21 ON 00-00-0000" in a red block. For additional information about minor licenses, visit here. License for minors is vertical. "UNDER 21 UNTIL 00-00-0000" is in yellow type on a red background to the left of primary photo. State header for Minor License is in yellow type within a green bar. State header for Minor Identification Card is in yellow type within a red bar. For additional information and/or an image, visit here. Minor license is vertical for new licenses with photo on left and red "UNDER 21" to right of the photo. Birthdate is in black for permanent licenses and in red for interim licenses. 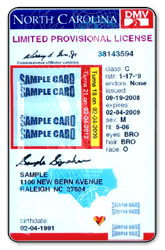 Prior licenses are valid until expiration date and have a red header and a red box around the photo with "UNDER 21" vertically down the left side. "Georgia DRIVER LICENSE" and the birth date are in red. For additional information and/ or an image, visit: Georgia Department of Driver Services and click on "DDS Brochure New License Design". Minor License is vertical with the date of birth printed in black. "21st: 00/00/0000" and "18th: 00/00/0000" are printed in white within a red bar to the right of photo. Gradient (dark to light) pink shading exists on top of card with primary photo beneath. Under 21 Licenses and Provisional Licenses have a rainbow appearing underneath photo extending to bottom right. Under 21 Permits do not have rainbow. Previous licenses are valid until expiration date and are vertical with red "UNDER 21 UNTIL 00-00-0000" above the photo and below the head bar. For drivers under 18, previous licenses have "PROVISIONAL" on the right side in dark pink. For additional information and/or an image, visit: Hawaii's State Official Site. Minor under 18 licenses are vertical with a green photo border and white "UNDER 18" at the top and bottom and a red "UNDER 18 UNTIL 00-00- 0000" at the bottom right. Under 21 licenses have a red border around the photo, with "UNDER 21 UNTIL 00-00-0000" printed in red in the bottom right part of the license. For additional information, go here. Minor license is vertical, with photo on left. "Under 21 until 00-00-0000" is printed vertically in white in a red bar to the right of the photo. "Under 18 until 00-00-000" is printed in black in a yellow bar to the right and beside the red bar. There is a duplicate ghosted image at the bottom right of the card. For additional information and/or an image, see here. Minor license is vertical with white "Under 21 Until 00/00/0000" in a red bar to right of photo, and/or a black "Under 18 Until 00/00/0000" in a yellow bar placed vertically at the right of the photo. If a driver is younger than 18, the word "PROBATIONARY" is printed beneath the state name bar. See additional information about minor licenses here. Minor license is vertical with "Under 21 UNTIL 00-00-00" in yellow print in a red block at right. Two photos appear on license with the primary one on the left with "DOB" directly to the right. Previously, minor licenses were vertical with the name, address and date of birth in red. For additional information and/or an image, visit: Iowa Driver's License type and fees. Minor license is vertical with a white "NOT 21 UNTIL 00-00-0000" in a red bar, or a white "NOT 18 UNTIL 00-00-0000" in a green bar under the photo. Minor license is vertical. "UNDER AGE 21 Until 00-00-0000" or "UNDER AGE 18" UNTIL 00-00-0000" in red to the right of the photo. For additional information about minor licenses, visit: Kentucy Driver Licensing. Minor licenses are vertical with a red "Under 21 Until 00-00-0000" and "Under 18 Until 00-00-0000" to the right of the photo, at the bottom left with a red frame. For additional information about minor licenses, visit here. Minor license is vertical. "UNDER 18 UNTIL 00/00/0000" and "UNDER 21 UNTIL 00/00/0000" appears stacked to the right of the primary photo. A small duplicate ghosted image is on the right in the middle. For additional information and/or an image, visit: Maine Driver Licensing. Minor license is vertical with photo bordered in red and "Under 18 Until 00-00-0000" or "Under 21 Until 00-00-0000", both in red, above the photo. UNDER 21 ALCOHOL RESTRICTED is below the photo, in white. Minor license is vertical. "UNDER 18 UNTIL 00-00-0000" and "UNDER 21 UNTIL 00-00-0000" is in red, above the name/address. Date of birth overlaps the shadowed image. For additional information, go here. Minor license is horizontal. Photo has a red border and "UNDER 21" is printed in yellow at the top of the photo. If under 18, the license states "PROVISIONAL" and the date that the minor will turn 18 is in red text to the right of the DOB. For additional information, go here. Minor licenses are vertical with state name in green and "UNDER 21 UNTIL 00- 00-0000" in white text, below the photo in a red bar. "UNDER 18 UNTIL 00-00- 0000" is in black, and is in the yellow bar beneath the UNDER 21 red bar. The year of birth is above the shadowed photo image, and the license may include a yellow "INTERMEDIATE LICENSE" in heading. For more information, go here. Minor license is horizontal. The primary photo is on the left and "UNDER 21 UNTIL 00­00­0000" is at the top, in red text. For drivers under 18, "Missouri" is in purple and "INTERMEDIATE LICENSE" is beneath the state name on the top left. A small duplicate ghosted photo is on the bottom in the middle. For more information and/or an image go here. Minor license is vertical with "Under 18/21 UNTIL 00/00/0000" in a red bar vertically to the right of the photo. For additional information about minor licenses, visit: Montana Driver Licensing. Minor license is vertical with a red "UNDER 18 UNTIL 00-00-0000" and/ or "UNDER 21 UNTIL 00-00-0000" under state name. For more information and/or image go here. Minor license is vertical. Red 'UNDER 21 UNTIL 00-00-0000" and 'UNDER 18 UNTIL 00-00-0000" to the right of the photo. For more information and/or image go here. Minor license is vertical with photo under state header. "UNDER 18 UNTIL 00-00- 0000" is in white text in a pink bar. "UNDER 21 UNTIL 00-00-0000" is in white text in a red bar below the pink bar in the lower left of the license. For more information and/or image, go here. Newer minor license is vertical with "UNDER 21 UNTIL 00-00-0000" in red frame around photo with yellow print. For more information and/or image, go to: New Jersey Driver Licensing. Minor license is vertical. "UNDER 21 UNTIL 00-00-0000" is in white text in a red bar and "UNDER 18 UNTIL 00-00-0000" is in white text in a pink bar, in the lower left of the license. For additional information about minor licenses, go here. "Under 21 Until 00-­00-­0000" and/or "Under 18 Until 00­-00-­0000", ID number and date of birth are printed in red on the right side of the photo. Under 18 licenses have LIMITED in red on the right side of the card. For additional information about minor licenses, visit here. Minor license is vertical. "Turns 21 on 00-00-0000" is highlighted in red to the right of the primary photo. "Turns 18 on 00-00-0000" is highlighted in yellow to the right of the photo if applicable. Small, duplicate ghosted image is at the bottom right. For more information and/or image go here. Minor licenses are vertical with a white "Turns 21 on 00-00-0000" in a red bar, and if applicable, "Turns 18 on 00-00-0000" in a yellow bar on the right side of the photo. For more information and/or an image, go here. Minor license is vertical, with a red header. The photo is in the top left and has a red border. Red "UNDER 18 UNTIL 00-00-0000" and "UNDER 21 UNTIL 00-00-0000" appear at the bottom right and overlap the duplicate ghosted photo. For additional information about minor licenses, go here. Minor license is vertical, and has the photo in a red border. UNDER 21 UNTIL 00- 00-0000 is in white text, in a red border. UNDER 18 UNTIL 00-00-0000 is in a yellow box to the right of the photo. 'LEARNER PERMIT" or "INTERMEDIATE" is in the header of the license. For additional information and/or image go here. Minor license has the photo on the right, bordered in red. UNDER 21 UNTIL 00-00-0000 is in yellow text, at the top of the photo; UNDER 18 UNTIL 00-00- 0000 is to the right of the photo. PROVISIONAL LICENSE will be printed on the license if person is under 18. For additional information and/or image go here. Minor license is vertical; black "UNDER 18 UNTIL 00/00/0000" in yellow bar above photo or white "UNDER 21 UNTIL 00/00/0000" in red bar above photo. Under 18 licenses have a green head bar with JUNIOR DRIVER'S LICENSE and JR in the map at the bottom right. For more information and/or image, go here. Minor license is vertical, with blue state name, top bar, and map. If a provisional license, headers are in yellow. The photo is bordered in red, and has UNDER 21 UNTIL 00-00-0000 in white at the top of the license. For more information, go here. For minors under 18, the license reads UNDER 18 UNTIL 00-00-0000 at the top right, and the photo is framed in green. UNDER 21 UNTIL 00-00-0000 is in the top right, and the photo is framed in red. For additional information about minor licenses, visit here. Below the header, "00-00-­0000 ­ 21st BIRTHDAY" in black, "UNDER 21" is below photo, and two-­digit phantom number of year of 21st birthday below the data area; dates of 18th and 21st birthdays listed on back. Red heading for under 21, green if restricted (shows "R" in restrictions field). For additional information about minor licenses, go here. Minor license is horizontal. If under 21, there is a red bar to the right of the photo with a yellow "UNDER 21 UNTIL 00-00-0000". Primary photo and address are on the right with license level in yellow title bar. There is small, duplicate ghosted image on the bottom left. For more information and/or image visit page 15 of the Driver's Manual. Minor license is vertical with red "UNDER 21 DRIVER LICENSE" and red "UNDER 21 UNTIL 00-00-0000" above person's name. For additional information about minor licenses, visit here. Minor license is vertical. Red 'UNDER 21 UNTIL 00/00/0000" and if applicable, blue "UNDER 19 UNTIL 00/00/000" above duplicate ghosted image. For more information and/or an image, visit here. Minor license is vertical. Operator license has the head bar in a plum color, and UNDER 21 UNTIL 00-00-0000 in red and UNDER 18 UNTIL 00-00-0000 below the Under 21 date. Junior Operator license has a yellow/orange head bar and the Learner's Permit has a pink head bar. For more information and/or an image, go here. Minor license is vertical with UNDER 21 in the header and on the back. UNDER 18 UNTIL 00-00-0000 and UNDER 21 UNTIL 00-00- 0000 is on the front at the bottom left. For more information and/or an image, visit here. Minor license is vertical. AGE 21 ON 00-00-0000 and/or AGE 18 ON 00-00-0000 is in black next to photo. For drivers under 18, INTERMEDIATE LICENSE is under the state name. For additional information about minor licenses, go here. Minor licenses are vertical. UNDER 21 UNTIL 00-­00-­0000 written in red below the photo. Provisional license has a pale green header bar. For additional information about minor licenses, visit here. Minor licenses are vertical. Under 21 licenses have a bright blue background, GRADUATED in red text below the heading and TURNS 21 ON 00-00-0000 in white text in a red bar to the right of the photo. Under 18 licenses have a dark red background, with TURNS 18 ON 00-00-0000 and INTERMEDIATE in red below the heading. For additional information about minor licenses, visit here. Minor licenses are vertical with a white "Turns 21 on 00-00-0000" in a red band and, where applicable, a black "Turns 18 on 00-00- 0000" in a yellow band below the photo. For more information and/or an image, visit here. Minor license is vertical with the photo on the left. Red "Age 21 on 00-00-0000" and, where applicable, "Age 18 on 00-00-0000" are below the heading on the right. For more information and/or image, go here.